14K Yellow Gold Crown Prongs Old Faceted Amethyst Victorian Antique Brooch Pin. This Yellow Gold Antique Estate Brooch is Hand Made and has a Gold Frame with a very fine Rope turned Detail near the Edge. This Antique Victorian Pin is round and measures 3/4 in Diameter. 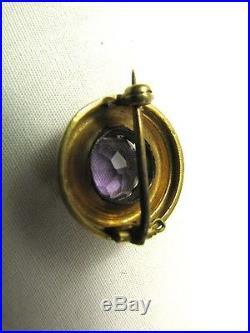 It is set with a 10.6 mm, Deep Purple, Faceted Amethyst that has a "Crown" Style Prong Bezel. On the back there is a hinged Pin stem that rests in a steel Circular Locking clasp that is in Very Good working Condition. It is unmarked as is much of the Jewelry of this Period. It has been tested and is 14K Gold. Overall this Antique Brooch is in Excellent Condition. It weighs 3.1 Grams. We have included up-close photos of this item in this listing. Please refer to our photos for a visual description and completely read the listing description. Please Note that Precious Metal Jewelry Listings may include approximate weights in Grams, Troy Ozs. And/or DWT (Pennyweights) Any weights noted in our listings are approximate only. We do not sell items as scrap value. Weights that may be included in this listing are to help describe the item. Questions emailed on the last day of this listing may not be received in time for us to respond. All items listed are antiques, collectibles, used or vintage, and are from consignors or estates. We make every effort to describe each item honestly and accurately. Numerous pictures are presented with each item. All items we list are antiques, collectibles, used or vintage, and from consignors or estates. Every effort is made to describe each item honestly and accurately. International Buyers - Please Note. Although we have initially blocked this option in this listing, it is b. 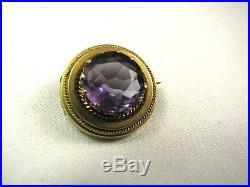 The item "14K Yellow Gold Crown Prongs Old Faceted Amethyst Victorian Antique Brooch Pin" is in sale since Monday, September 23, 2013. This item is in the category "Jewelry & Watches\Vintage & Antique Jewelry\Fine\Victorian, Edwardian 1837-1910\Pins, Brooches".
" and is located in Providence, Rhode Island. This item can be shipped to North, South, or Latin America, all countries in Europe, all countries in continental Asia.